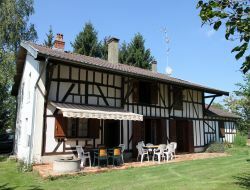 Holiday cottage in Haute Marne. Champagne house for 14 persons located 15km from the Lac du Der, largest artificial lake in Europe, near Troyes, lakes of the forest in East and Nigloland. Cottage independently on a closed ground of 2000m ², all comfort, 4 bedrooms, terrace, garden furniture.